SHARIF KABUNGSUWAN!!! RACE OR RELIGION CONQUER MINDANAO? RACE OR RELIGION ANG SUMAKOP? WHAT DO YOU MEAN BY “NATIVE” OF JOHOR MALAYSIA? 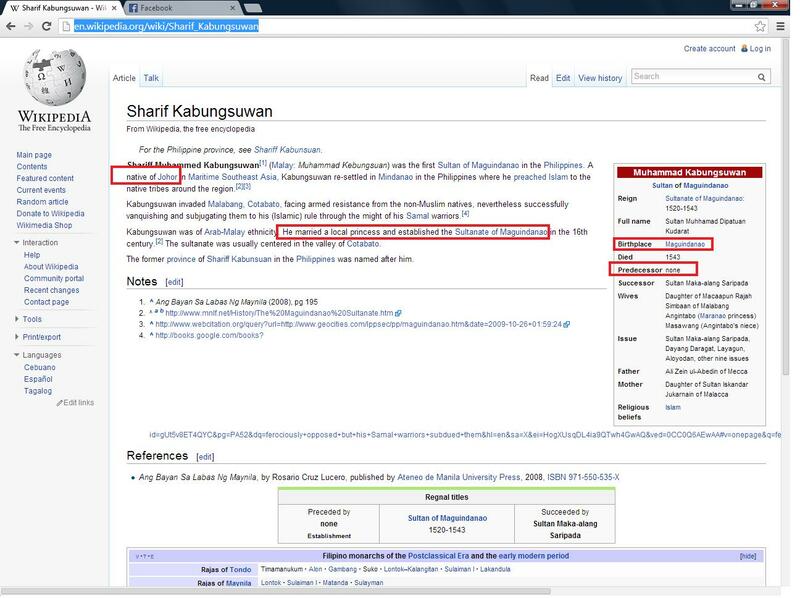 THEN BORN IN MAGUINDANAO? NO PREDECESSOR MARRIED TO LOCAL PRINCESS OF PHILIPPINES! 1521 PHILIPPINES ALREADY THEN The name Sultan Kudarat given to the province was derived from a Muslim ruler, the late [[[[[[[[http://en.wikipedia.org/wiki/Muhammad_Kudarat ]]]]]]]]] who begun to assert his leadership in the year 1619 and reigned the Sultanate of Maguindanao from January 1625 to 1671 AD.